Interstate 40 stretches 177.14 miles across the Texas Panhandle, joining the city of Amarillo with Adrian and Vega to the west and Groom, McLean and Shamrock to the east. Speed limits top out at 75 miles per hour outside Amarillo and at 60 mph across the city. 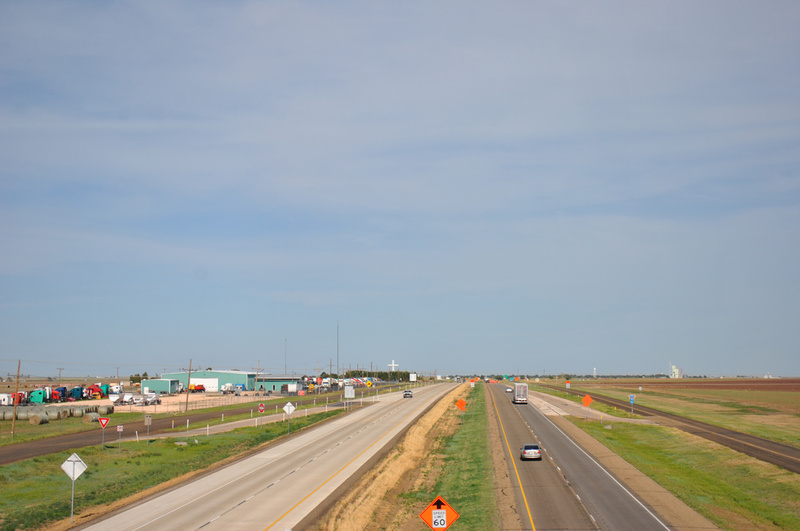 Easterly view of Interstate 40 from the FM 1547 overpass in Lela. Photo taken 05/05/12. 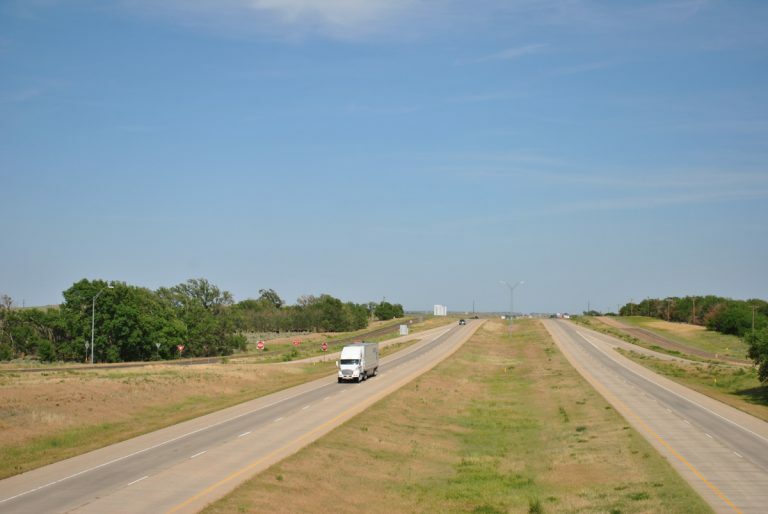 Approved by the Texas Bureau of Public Roads in 1959, IH 40 replaced historic U.S. 66 west to Barstow, California and east to Oklahoma City, Oklahoma. Seven business loops and spurs are posted for IH 40 in Texas, all along old sections of U.S. 66. Interstate 40 was nearly complete by the time the 1976 Texas Official Highway Map was released. 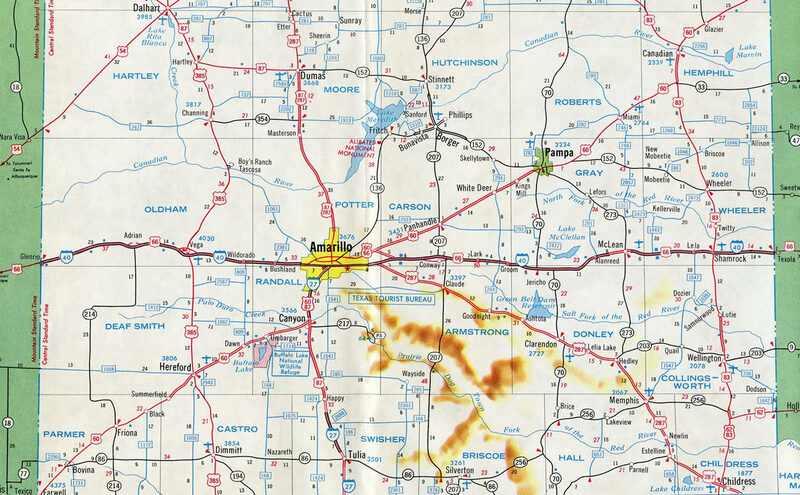 The freeway west into New Mexico and east into Oklahoma was incomplete at the time. A cross 19 stories in height rises to the east in scene from the FM 294 overpass outside of Groom. Photo taken 05/05/12. A trailblazer for IH 40 west directs motorists from the access road joining FM 294 with the freeway frontage road at Exit 109. Photo taken 05/05/12. A slip ramp completes the movement from FM 294 to IH 40 west ahead of Conway. Photos taken 05/05/12.